and runs, loves, and thoughts and things. a linkup with Becky, Katie, Jenn, Amanda, and Heather. Forward: I have a habit of making a many drafts but never publishing them because they get too old and I lose interest. So, to clear the long list of unpublished posts, I’ve compiled a bunch into this one post right here the things I wanted to get off my chest. Grab a seat and some popcorn; this post is going to be long, jumpy, and nonsensical because that’s how a) my life works and b) my thought process processes. In fact I’m in such a rush that I’m not going to proofread this post. Nope, not one word. Everything you read here will be raw and fresh and completely scattered. I should remind you of the $1 Paleo Book event going live on November 25th and you can check out all the info here; you really don’t want to miss this smash hit deal! 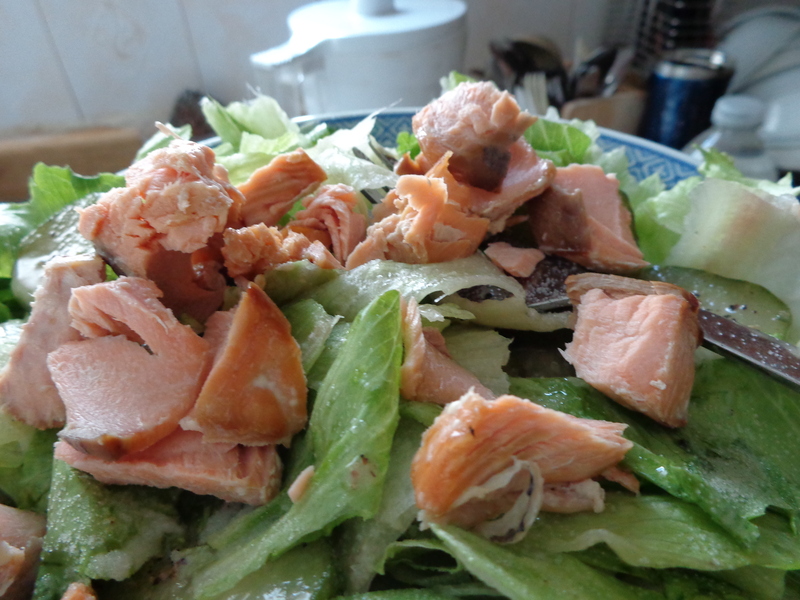 Salmon salad with MCT oil, coconut vinegar, mustard and salt dressing. Preheat oven to 375℉. Mix everything together, dollop your spoonfuls on aluminum foil and bake for 15 minutes. They’re not paleo or keto, but if you have little time and guests to please, this recipe will come in handy since its so simple to make. And oh, this from last week? Remember this? Plug your nose! IT WAS ACTUALLY BEEF LIVER. Total of…11.4kilometers today??!! WHAT WHAT WHAT? IS GOING ON? I AM SO PROUD OF MYSELF I CAN’T EVEN BELIEVE IT!! When was the last time I ever ran more than 10k? UHM…SOMEONE TELL ME FROM THE ARCHIVES because I must be dreaming! gahh!!!!!!!!!! YES! YES! YESSSSS! SO F*CKING HAPPY! Went out for a fasted afternoon run today around 5pm at my favourite cross country mini meet park. Our coach drove my friend and I to go for a quick run in the park, which is really beautiful and lush with bushes, trees and dirt trails. I felt sleepy and nearly fell asleep during the ride there. Needless to say, I wasn’t feeling my all best for running, it the moment I did start I felt instantly more alive. 10 minutes into the run, I felt ready to speed up but held back for my friend who was dealing with menstrual cramps. About three quarters of the way into the run it began to pour. I haven’t experienced soaking like that since beginning of August when I had to run home with two siblings in the rain. The run was cut short due to the rain and I was surprised I finished 4k in such little time. I mean, I wasn’t counting, but the fact that I was having SO MUCH FUN running is such a surprise! I wanted to run forever and ever and ever. I had so much energy and spirit left that I didn’t want to stop. It’s runs like these that remind me why I love to run, and why I drag myself through exercise—I never regret it and I love it. This was the best run, despite getting soaked, that I’ve had in a long time. I fell madly in love with running again today. Run 3: Who knows when I ran 10k! Technically, I ran 10.4 km, but also, technically, I tend to be unconventional in that I spread cream cheese over omelette instead of butter. That didn’t even make sense. But technically, I don’t give a damn. I ran 10k! Whoop whoop! (This post is long overdue, since I ran 10k 2 more times after) I can only recount three times in my whole history of 17 years and 6 months that I’ve done a long run. Once, two years ago in late November, a friend and I completed 10k; the second by myself some Saturday a few years ago after eating a big bowl of peanut butter oatmeal–I was the typical “carppy” aka crappy + crab-fueled runner back then–I felt crazy enough to run 18 kilometers in just over two hours(link) (the exact time and distance I’ll never know since I didn’t have an app with GPS on it to track), and today’s 10k is the third and latest time I’ve ever ran a long distance. I rarely run more than 4km but over the years I built up stamina, and 4km runs no longer feel satisfying. This 10k I clocked in at 1:06 hours as compared to 56 minutes my first time. Lately, my pace has (slowed down thesaurus), but rather than dwelling on that slow factor, the following question came to mind: could I potentially complete an ultra marathon competitively? I do hear that “the slower, the better the longer the race.” Tough luck, Linda. Your school only marks you on 12-minute runs and beep test sprints. Not my forte. It takes me 20 minutes just to warm up. And even then! Back to the 10k. I did it! I surprised myself with the time I could consume running. Rarely have I ever ran more than 30 minutes so I was nervous about starting to get bored and tired and call it quits by kilometer 5. I ran through a big forest and on a hydropath through frozen air. You know that feeling when you just reenter the house from the cold? Stiff…hands…can’t….move… I need some sleek hand gloves to keep my joints healthy and my hands warm. I kept alternating hands holding the phone while I pulled the sleeves of my hoodie over the balls of my fists. Around kilometer 7, my feet started hurting. I get blisters if I run really long distances or Sprint; I don’t know if it’s a running posture issue or if my ankle rolling in with each step but it might be something to get checked out, or maybe it’s just my feet adapting to new mileage. Kilometer 6-8 is quite possibly the hardest part of an entire 10k mentally. Despite clocking in past 60 minutes which was slower than my best time, I can’t say that I’m not proud of myself for trying! Indeed the run was long and crappy but I proved to myself that I am now fully capable of tolerating longer distances. From now on, I will begin to increase mileage little by little until one day a 10k will be as effortless as a 3k and I can run half marathons like nobody’s business. I love rewarding my little siblings with treats. Okay so yesterday a girl fainted in the middle of class as we were going over music and she recovered really quickly. All I could think of at first was, “Did that really just happen?” Because she sort of just dropped dead. I thought it might’ve been from crashing dieting or dehydration or just low iron or something and she played it off like it was lack of food but I later found out she was smoking weed right before the class, but of course she couldn’t say that to the teachers. It was probably the most shocking part of my day. Also, my suspicions confirmed about that girl who couldn’t partake in female fitness—she did struggle with anorexia/dieiting but I didn’t approach her about it nor am i judging her for it. I just hope the best for her and I want to hear her side of the story out, because when the same thing happened to me, it wasnt anorexia, it was a different case and yet no one heard me out because no one gave me a chance to speak the truth of the matter and that hurts to this day. Halloween is also coming up and I have rehearsals on that date. I wanted to go to whole foods to redeem their treat bag(“no spooky ingredients!”) But now i can’t. DAMN IT! I walked for a part of my run this morning which is something I almost never do, and guess what, it’s not bad. Its okay to tone down the intensity sometimes. I alwats rev it up and this was a good counterbalance. I took a new route and was afraid I’d get lost but luckily that was not the case! Insanity is tiring me out and I think I will take a break from it so I can come back stronger. And…..tomorrow I will be having some pork leg marrow/knee cartilage which sounds gross, but is actually SO good. This has been an update. 4TH DOWN FROM THE TOP! Read it and weep/ *smirks*. TARA STILES SCREENSHOT LIKED MY PICTURE. WHAT WHAT! Honestly addicted to the whole foods self-serve nut butter machine that yesterday I broke my “nut-free” streak and ate like 10 tbsp of of almond butter trying to be discrete. The past few nights have been filled with late night rehearsals/shows. I can’t say that I’m not drained from the experience of being Ganymede but it was fun. On the last night I hat nearly fell off and I kept fixing it on stage. It was such an embarrassing blunder but I played it off well. So because I’ve been dedicating 80% of my life to the school this past week, exercise and sleep have pretty much gone down the drain but I’m determined to bounce back strong. Surprisingly, diet has been ok! On the last night I went to the cast party(the post-show party that the cast goes to, hosted by one of the cast members) and they partied hard. I got to watch classmates get totally wasted and smoke week and drink and just go wild. I didn’t have any alcohol myself, nor did I get the memo that we were supposed to bring something hot to wear—I just wore whatever I wore to school prior to changing into costumes. I’m happy that I did resist the pizza the hostess ordered(they ordered 4 boxes from pizza nova and their house is absolutelyrich). To be honest, I didn’t have the time of my life. Maybe it’s because i’m too shy to go wild with them(they intimidate me and I’m just “the good girl”). I left the party early with no regrets and tried to fall asleep at 12:30am. And thus has been my Friday night. What’s your typical 10k time? This entry was posted in Uncategorized and tagged 10k, run, update. ← 8 Minute HIIT Workout!